We are engaged in Manufacturing and Exporting of Metallised PVC Film in the international markets. We do metallising process in our in-house laboratory to add value to the product. 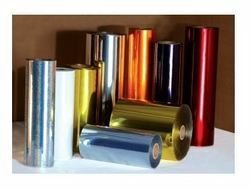 These Metallised PVC Films meet requirements of end-applications. In Metallised PVC Films advantages of both Metal and PVC Films are available offering wide scope for varied packaging applications. As barrier properties get increasingly important for packaged food products, flexible players in the space seem to be gearing up for the development. Cosmo Films, known for its specialty films offers multiple barrier products. We are offering wide assortment of Window Metalized Film. These are available in different specification. Our window metalized films are transparent, reflective and weather-resistant. They have high resistance towards temperature, scratch, chemical and elongation.